The 25' AmeraCat is the first ever fully functional single engine catamaran fishing boat. The 25' AmeraCat is now available to the public. AmeraCat is an exceptional platform for many types of government, law enforcement, and commercial use. 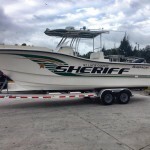 AmeraCat is presently in service with St. Lucie county Sheriff’s Office, Fort Pierce Police Department, Dixie County Sheriff’s office, Sanibel Island Police Department and Ft. Pierce Harbors Pilot’s Association meeting and exceeding their expectations for tactical operation requirements everyday on the water. 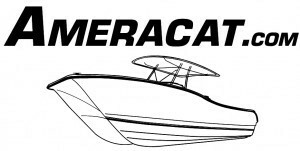 AmeraCat took the original 27′ Gen1 power catamaran and changed things up a little. We added higher gunnels, more displacement and added more interior space by increasing the beam to 9′. The 27′ Gen2 is great for any recreational or commercial use and can be fully customized to meet your needs. 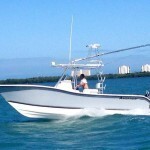 With great handling from this center console fishing boat, docking the 27′ Gen2 is a breeze. AmeraCat wanted to design a power catamaran that was in between 27′ and 39′, that is why we created the 31′ AmeraCat center console power catamaran. We feel that for the sport fisherman, this is one of the best offshore fishing power catamarans we offer. 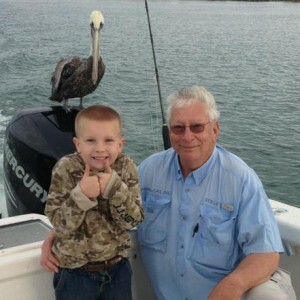 Great for Charter Boat Captains as well as the everyday fisherman. If you are ready to demo one of our Commercial or Recreational Offshore Fishing Catamarans, click the link below or call us directly at (772)359-3641. AmeraCat offers a variety of Center Console Fishing Catamarans, ranging from our 25' AmeraCat Hybrid to our 39' AmeraCat. All of our models are made with NO WOOD, rather with high density foam and hand laid construction. All of our offshore fishing catamarans are custom built to your specifications and you always deal with an owner of the company, not a salesman. Click below for more information. AmeraCat is an exceptional platform for many types of Government, Law Enforcement, Towing vessel and any Commercial use. AmeraCat is presently in service with St. Lucie County Sheriff's Office, Fort Pierce Police Department, Dixie County Sheriff's office, Sanibel Island Police Department and Ft. Pierce Harbors Pilot's Association meeting and exceeding their expectations for tactical operation requirements everyday on the water. Choose all of your upgrades and choose all of your own unique specifications for your new AmeraCat Fishing Boat. We have many different options to add to your new Power Catamaran. Add features like additional rod holders, outriggers, down riggers, dive platforms, bolster cushions, or any of our custom upgrades. We want you to build your offshore fishing catamaran just the way you want it. Click the link to create your custom catamaran. When it comes to creating your custom offshore Fishing Catamaran, it is important to have all of the accessories you need. 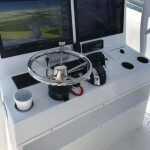 Whether creating an offshore fishing machine, dive boat or just your regular offshore cruising boat we have all of the custom options you could need. We design everything unique to your own specifications. We want you to be able to have your boat just the way you want it. We have below a few options for you to view. Be sure to add any custom options in the Build-A-Boat form when you are ready to design your AmeraCat.